Welcome to the first installment of 13 for ’13, our new series highlighting the best practices of the sheltering and animal advocacy world. Our hope is that the additional exposure for these programs will reach new eyes and inspire decision makers (or anyone looking to improve conditions for animals) to try something different — and ultimately, benefit from the successes of others with the same mission. We’re kicking off the series with a look at a program developed by the Helen Woodward Animal Center in San Diego, California. It’s called First Friends. First Friends is a unique, participatory program that introduces toddlers and kindergartners to animals of all kinds in a safe and informal setting. The “classes” take place right there on the campus where kids meet — and learn to respectfully interact with — some of HWAC’s more unusual residents. Previous sessions have included skinks, goats, and cockatiels. Simply put: Knowledge breeds compassion. Which means humane education is a crucial piece in ensuring a better future for animals. 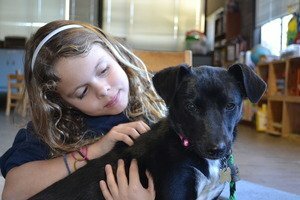 HWAC has created a program that engages kids as young as three years old — and has figured out a way to make the experience so positive and exciting, it sets the groundwork for a lifelong love of animals. 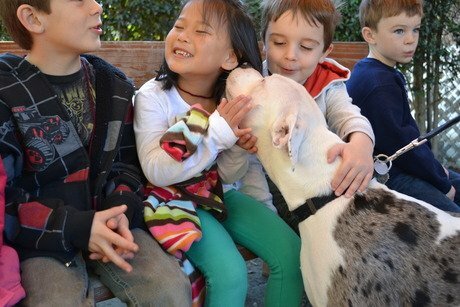 First Friends is just one of several of HWAC’s programs focusing on humane education. Custom tours enable visitors to check out what goes on at the facility behind the scenes. DogSmart was created to help people of all ages overcome their fear of animals. And Girl Scout and Boy Scout programs provide badge-earning opportunities and pin requirements. Helen Woodward Animal Center, DogTime salutes you!